This document is a letter typed on a half-sheet of letterhead. The paper is 8 1/2" x 5 1/2" watermarked ("Old Ta[illegible] Bond") bond paper, printed with the names of the office and two county clerks in blue ink. 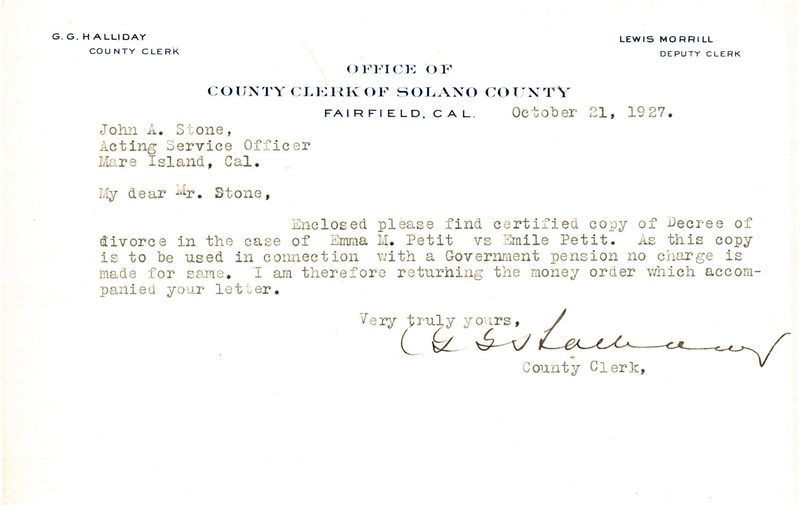 The short note is typed and dated October 21, 1927. It is signed, and if it weren't for the fact that the County Clerk's name is in the upper left corner, I would have no idea what the signature says. Because the name is available, I can read the signature as G G Halliday. The sheet was folded in half when I received it. I found this week's document interesting in a couple of ways. First, I was surprised that processing of the pension apparently required an additional certified copy of Emma and Emile Petit's divorce decree. 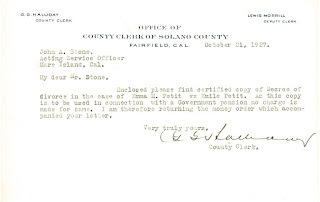 On May 17, 1927 Emma had sent a notarized transcription of the divorce decree to the Bureau of Pensions, along with other documentation required to support her pension application as Jean La Forêt's widow. So what was wrong with that document? I doubt seriously that the Bureau of Pensions would have known that there were three minor discrepancies in the transcription. Maybe they just preferred to have a copy directly from the court, rather than via a notary. I don't know how the certified copy that accompanied this note might have differed from the original or the transcription, because it was not in the goodie bag I received. Perhaps that's something else I'll get to see when I order the complete pension file. The second interesting thing about the note is that it's here in the first place. This is a note that was sent to the Acting Service Officer at Mare Island in support of Emma's pension application. Why did I find it in a collection of what appears to be Emma's personal family papers? Shouldn't it be in the pension file?